Cyperus eragrostis is a species of sedge known by several common names, including tall flatsedge, nutgrass, tall nutgrass, umbrella sedge, chufa, Earth almond, zula nuts, edible galingale and pale galingale. This species is native to the West Coast of North America from California to Washington, the Southeastern United States, Jamaica, and South America. It has become naturalized elsewhere in some regions in the northeastern and southeastern U.S., Europe, South Africa, and various oceanic islands (Azores, Canary Islands, Ryukyu Islands, Norfolk Island, Easter Island, etc.). It can become a weed where it is introduced; it has been known to infest rice fields. It is found in riparian areas, roadsides ditches, damp grasslands, and other moist habitats. 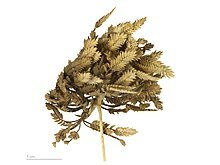 Cyperus eragrostis is an herbaceous perennial growing from rhizomes. 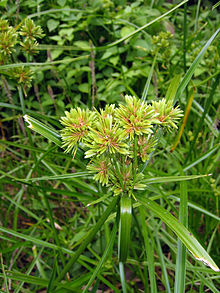 It is a green sedge with tall, erect stems, 10–90 centimetres (3.9–35.4 in) in height. Long, thin, pointed leaves radiate from the top, similar to parasol ribs. Its flowers are found within tough, rounded, greenish-yellow or beige spikelets. Fruiting is in the summer. ^ Flora of China Vol. 23 Page 229, 密穗莎草 mi sui suo cao Cyperus eragrostis Lamarck, Tabl. Encycl. 1: 146. 1791. Wikimedia Commons has media related to Cyperus eragrostis. This Cyperaceae article is a stub. You can help Wikipedia by expanding it. This page was last edited on 15 February 2018, at 00:19 (UTC).